This paper describes a novel, XML-based approach towards managing and querying forensic traces extracted from digital evidence. 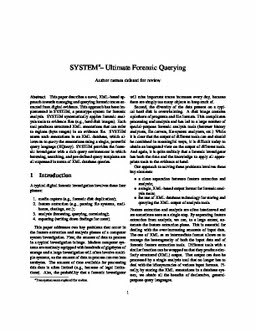 This approach has been implemented in XIRAF, a prototype system for forensic analysis. XIRAF systematically applies forensic analysis tools to evidence files (e.g., hard disk images). Each tool produces structured XML annotations that can refer to regions (byte ranges) in an evidence file. XIRAF stores such annotations in an XML database, which allows us to query the annotations using a single, powerful query language (XQuery). XIRAF provides the forensic investigator with a rich query environment in which browsing, searching, and pre-defined query templates are all expressed in terms of XML database queries. Alink, W, Bhoedjang, R, de Vries, A.P, & Boncz, P.A. (2006). XIRAF: Ultimate Forensic Querying. In Proceedings of the Digital Forensic Research Workshop 2006 (pp. 1–26). Nederlands Forensisch Instituut.